Bored so I pulled the plugs out of the Bay since I had not checked them in a while. Three of the plugs were perfect, the #1 plug was red like it was rusty. Any ideas - I have never seen this before. How long has the bus set from it's last outting? My thoughts are that it was the last cylinder to get gas before shut down and the resoluting condensation corroded the plug. This is of course only a guess! Just drove it to Fort Worth and back, never missed a lick the entire trip. 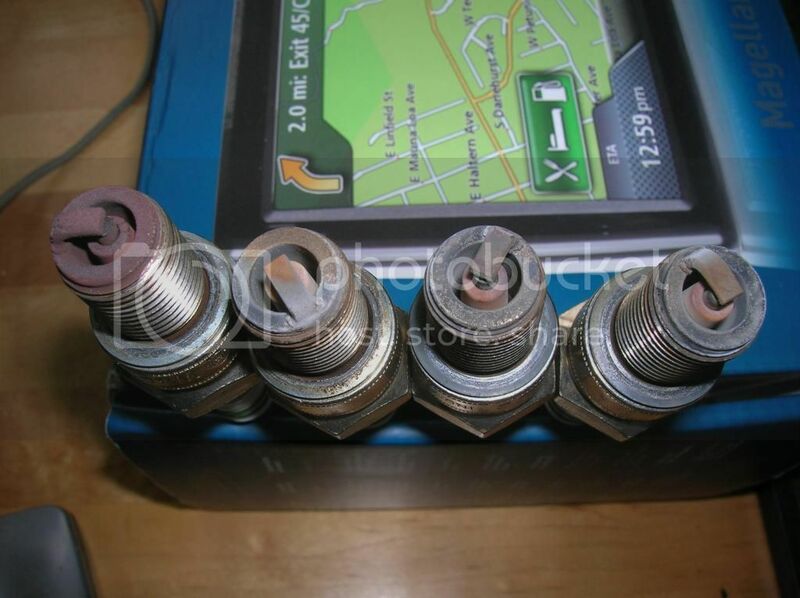 APPEARANCE: Spark plugs fouled by MMT (Methycyclopentadienyl Maganese Tricarbonyl) have reddish, rusty appearance on the insulator and side electrode. CAUSE: MMT is an anti-knock additive in gasoline used to replace lead. During the combustion process, the MMT leaves a reddish deposit on the insulator and side electrode. RECOMMENDATION: No engine malfunction is indicated and the deposits will not affect plug performance any more than lead deposits (see Ash Deposits). 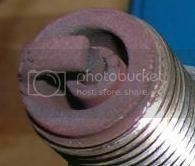 MMT fouled plugs can be cleaned, regapped and reinstalled. Any idea why one would be affected? I did have to purchase some of that fine ethanol laced Texas fuel. Maybe one cylinder is lower / higher in compression? I guess I will check that as well. This engine has been solid as hell since I rebuilt it, just bothers me a bit why one cylinder is acting differently. I think I will throw in a new set of plugs and check them again in a few K miles. If it runs well, F-it. I will swap the injectors to see if the problem follows it, maybe the injector is causing a rich condition which is creating the deposits. It's not rust as it scrapes off easily. Getting the bus ready for the trip to Eureka Springs a few weeks back and noticed the bus was smoking pretty good (out of the exhaust not the windows!). Anyway parked it and took the bug to Eureka, had to take a trip to Brazil for a couple of weeks and just now got a chance to drop the engine. Pulled the head off the offending side (black plug) and the intake valve is just rattling around in the valve guide. All the rest of the guides look fine but I have never seen a guide worn like this one, there must be 0.50 on either side of the stem, no wonder it was burning oil. Now the search is on for someone to replace the guide. Woa. Glad u found it before boom. I know 9 fingers got buddy rice to do seats, not sure about guides. I know Jon joyce in Edmond opted to buy heads from a place in Cali. Buddy Rice did guides for some t1 heads for me. They cracked the head from guides to ehaust valve seats. Price was reasonable though. Mofoco rebuilds heads but they always seem to be backed up. Took both heads to Buddy Rice yesterday, only need the one guide replaced but I wanted him to check everthing out since I had the engine dismantled to that point anyway. He is busy too, maybe 1-2 weeks before he can finish. He had some Corvair heads there as well, said he is doing more and more air cooled heads. I was hoping to take the bus to Tahlequah Oct 11th but that seems to be a stretch now, need a couple of days to put the engine back together and install it back in the bus - a couple of hours to re-assemble and install, but it takes a day to put all the tin back on one of these 2.0L !! i asked jon who he got his heads from. i will report back since he dont post on here. Upon disassembly of the heads I discovered the intake valve was sloppy in the valve guide. Took both heads to Buddy Rice and had them rebuilt. Got them installed and everthing seems good now. Made the trip over to the Plaza this weekend, and made it back! With the exception of dialing in the cold idle I am ready to hit the road again. look at the center electrode on the far left plug...it's cracked in a couple of places. The plug was firing, but not properly. During the trip to Eureka the bus was using oil. Pulled the plugs and 3 & 4 were oily and 1 & 2 were normal. Compression is good and equal on all four. Going to check valve gap tomorrow night but I find it hard to believe I would have screwed that up. Any ideas why both cylinders on the same head would show oil?? At least it is easy to drop a bus engine out. Those cylinders were fine before the heads were redone. I did not remove the cylinders just the heads. Not many miles since the heads were redone,trip to Dallas and eureka plus a.few runs around town. It's a.head scratcher! To much oil? The crank would throw more in those cylinders if you had too much in the case. Maybe you need those internal tins from a 2.0L 914. No, I do not think it was too much oil, It took about 2 quarts to get home from Eureka. Based on your comment it is a good thing I do not race it at NASCAR, oh wait they just turn left - that would help the situation! Going to check the valve clearances, maybe pull the rocker arms and springs off the heads to see if I feel any slop in the valve guides on that side. Just find it hard to believe that two cylinders in the same head have the problem. ATTENTION ALL SMART PEOPLE - I NEED HELP! Pulled the heads again, #3 and #4 pistons were caked with carbon, #1 and #2 had more than expected. Now the problem, the valve guides are shot again! Had them re-built back in November last year but I haven't put on but a couple of 1,000 miles. Drove it around town a bit, took it to Dallas this spring, the Yukon show and then to Eureka where I was seen some smoke and oil usage. I have always had decent oil pressure on the gauge, red light has never come on during running. Cylinders look fine, still can see the cross hatching. How do the guides get oiled anyway?? they are on the top of the heads, push rods on the bottom, figure the oil comes up through the hollow push rods but then what?? Dang thing ran fine for 4 years now this...........! perhaps the shop used crap? or they werent reamed correctly? The rocker arm is cross drilled and the oil goes through it and comes out around the threads of the adjusting screw. Whatever works its way down the valve stem lubes the guide. That and the silicone bronze is self lubricating. Which valve guides are worn? Exhaust are worn. From.the web it looks like they should be bronze. This engine had steel guides which may be the reason buddy rice put them back in. "Dad" did the first rebuild, "son" his who I talked to this week and he mentioned bronze. They ordered the parts from Kerr so you would think all would be good. I still have the heads from the original engine ( valves burnt into the head) I need to see if they were bronze. Hopeful they will work with me on costs I don't want to be finance them another race car. Did you do anything to change the geometry? Different cam, rockers? Have you checked the geometry at all? If it is too far out, the guides will wear prematurly no matter what they are made of. my mini engine most shops recommend steel. I still went with bronze just incase. More $$, dunno the longterm outcome. Did nothing to change the geometry, everything is stock as far as I can tell. I will check everything when I reassemble. I always bag every part and Mark it so that everything goes back where it came from. The first time it was the #1 intake valve, 2nd time was 3&4 intake valve (guide). Might get your tank lined at a radiator shop. No flycut on the heads? NEGATIVE WAVES? The process is covered in several manuals, I use the book by Bill Fisher "How to hot rod Volkswagen Engines". Anything can change the rocker geometry, flycut included. You can get by with being a little off optimum, but it puts a side strain on the valve & the guide is the weak point, so it suffers. Does it look like there is a oiling problem? Make sure the oil holes are all clean, the valve stem gets a minimal amount of oil with everything kosher. Might look at that . That's all from this old man for now. Good luck. JP Mary Fallin 4 guv. Got the call that my heads are ready to pick up. They said that they replaced all 4 intake valves, they said it was due to running lean. The engine is fuel injected, not like I can adjust that. On reassembly I will triple check the entire intake path to ensure that there are no leaks. I just do not understand if the engine is running lean why it would cause the intake guides to wear - going to take a few cans of liquid wrench (wheat sodas) to think through that one. I still think the guides were getting plenty of oil as in the end the engine was smoking and the pistons were caked with carbon (3&4). OK picked up the heads today. Questioned them about the lean statement as it still did not make sense to me, actually he ment running rich thinking the fuel was washing the oil off the valve stem. Don't believe that either as the valve travel is small compared to the length of the valve stem, plus since these are intake valves the engine vacuum should be pulling oil from the rocker side down the valve stem towards the piston. Did have them put in bronze valve guides which is what this engine is supposed to hAve. Now to get this thing back together. Engine is back in and running fine. Checked the all the valve stems were the correct height,put in New adjusters, made sure the rockers are aligned with the stems. All the guides are now bronze so maybe that will solve my problems. Getting good lube to the rockers as this is easy to verify without the covers! Got a good hour run time to break it in. Changed the oil and now time to drive it! 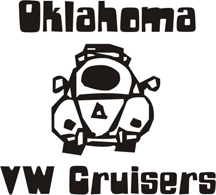 Not ready to drive it to tahlequah this week maybe I will treat her like a queen and trailer it..